We have been working closely with Drik on one of our most important drug discovery program. Drik understands our goals and provide us valuable input and feedback. They are knowledgeable in designing and executing the study. Their timely response to our requests has been rewarding and helped us move forward in the discovery efforts. Quality and value of the studies together with expertise on the toxicology studies have been crucial and we look forward in continuing this positive relationship. - President and COO of Synereca Pharmaceuticals, Oklahoma. 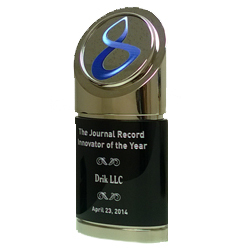 Drik was nominated and selected as one of the finalist for 2014 innovator of the year award of Journal Record. As per Journal Record, each year nominations for the award are submitted from around the State of Oklahoma for those products and services that exemplify an innovative spirit. This year’s group includes entrepreneurs from a diverse range of industries including health care, education and energy.